Bereits im Oktober berichteten wir als einer der ersten über ein 8,86mm dünnes Smartphone inkl. Android 4.1 Betriebssystem mit dem Namen OPPO Find 5. Dann folgte am 12. Dezember für das 5 Zoll Smartphone auf dem „The Fifth Element“ Event im 798 Art District in Beijing die offizielle Vorstellung. Leider finden solch durchaus interessante Smartphones oft nicht den Weg nach Europa. Doch Ausnahmen bestätigen die Regel. Denn wie nun auf der offiziellen Facebook Seite an Hand eines Bildes bekannt gegeben wurde, wird das OPPO Find 5 unter anderem auch in Deutschland zu erhalten sein. OPPO Digital als ein weiterer chinesischer Hersteller mit Sitz in Peking/Beijing hat schon im Vorfeld mit dem OPPO Finder von sich reden gemacht. Dieses wurde als das „World´s thinnest Smartphone“ beworben, was es wohl mit 6,65mm auch für eine gewisse Zeit sein sollte . Doch nun überrascht uns OPPO mit einem geheimnisvoll retuschiertem Bild (unten rechts) mit Preisen für das 16GB Modell von 499,-US$ und dem 32GB Modell für 569,- US$. Doch dem nicht genug, soll es auch der Grafik zu Folge den weltweiten Feldzug antreten und könnte so als Dritter großer Hersteller aus dem Reich der Mitte neben HUAWEI und ZTE in den Wettstreit treten. Aber wollen sie wirklich ein weiterer Anbieter im Low Budget Bereich werden? Preise von umgerechnet 378,-€ bzw. 430,-€ lassen nicht gerade auf Schnäppchen hoffen. Eher ist das in unseren Augen LG Niveau, die ja zuletzt mit dem LG Nexus 4 weltweit für ausverkaufte Regale gesorgt haben. Wir dürfen also gespannt sein ob sich das OPPO Find 5 bereits auf der CES in Vegas oder doch erst auf der weltweit wichtigsten Mobilfunkmesse, der MWC 2013 Ende Februar in Barcelona, zeigen wird. [EXPAND Pressemitteilung]BEIJING － December 12, 2012 － At the OPPO Find 5 “The Fifth Element” Launch Event held in 798 Art District today, OPPO introduced one of this year’s most mysterious and anticipated mobile products, the OPPO Find 5. The all new, industry leading OPPO Find 5 was announced to an audience of over 500 members of the international press, OPPO fans, developers, and partners, in what marks a spectacular end of year for the mobile industry. See – like you’ve been blind all along The OPPO Find 5 features a 5.0” 1080p IPS screen with a staggering 441 PPI pixel density, allowing you to experience a world of crystal clarity and the most realistic colors. With OGS technology that combines touch sensors with display, colors are more vivid and lifelike, and you’ll feel as if the screen contents are floating on its surface. Despite its large screen, the OPPO Find 5 is easy to hold thanks to its super slim 3.25mm bezel. When the screen is off, the front becomes a borderless sheet of pure black, mysteriously calming yet satisfying to the eye. Touch – and your fingers won’t stop Industrial design has always been one of OPPO’s core strengths. An example is the Find 5 front frame. Although it only weighs a mere 6.3 grams, the front frame alone takes four hours to craft. Starting with a 210 gram piece of stainless steel, it undergoes 12 manufacturing processes, after which it is given a black chrome plating in a 1470 °F (800 °C) vacuum environment. The result from this demanding process not only protects the screen from impact, it also contributes to the Find 5’s amazing look and feel. The overall design of the Find 5 is minimalist, relying on straight lines and simple shapes that removes distractions, while at the same time being built using the best materials and techniques available, giving OPPO Find 5 a simple and understated, yet refined and premium look and feel. Cherish and share, the beauty from every journey On the backside, OPPO Find 5 comes with the most advanced 1/3.06-type 13-megapixel camera sensor available on the market, adept at taking great photos in low light conditions. With market-leading Stacked CMOS technology, it features an f/2.2 aperture, 4-layer coating and blue glass filters. 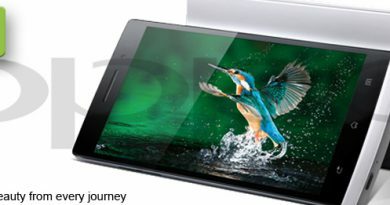 On the front, Find 5 it is fitted with a 1.9-megapixel camera. 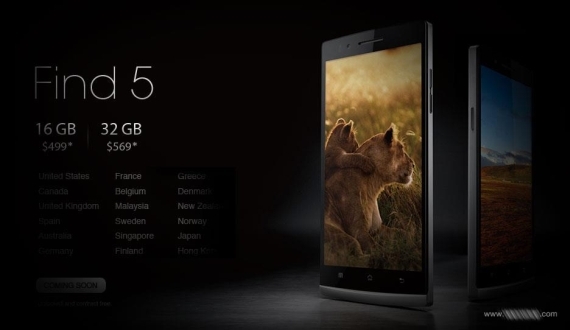 OPPO Find 5 is the world’s first smartphone with hardware supported HDR photography and video recording. It redefines smartphone video recording, with its capability of recording video in 120 FPS, five times the speed that the human eye can perceive. Apart from videos being silky smooth in normal playback, they will also be smooth during slow-motion playback and clear during freeze-frames. In addition, the camera on the Find 5 is capable of taking 100 photos at 5 per second with Burst Mode. OPPO Find 5 will bring you into a new era of wireless sharing. With NFC functionality, gently touching two phones will pair them in less than a tenth of a second, 50 times faster than Bluetooth pairing. OPPO’s NFC SmartTags with preset actions will add simplicity and convenience to your life. Find 5 also supports Wi-Fi Display and DLNA, two technologies that allow you to wirelessly project screen contents onto your television in HD. Listen, and rhythm will touch your heart Find 5 comes with the powerful Dolby 3D surround sound technology and the exciting Dirac HD technology, combination of hardware and software usually only found in high-end audio and cinema sound systems. With Dirac, you will clearly hear a difference, and become immersed in music the way the artist originally wanted to express it. Love, for it is the Fifth Element OPPO never set out to create the most powerful phone. Internally, we have always said that we create products in the intersection of romance and technology, and Find 5 is a product that OPPO employees worked passionately and relentlessly on. Just like Plato was convinced of quintessence, an element beyond the material world, there is more to the Find 5 than the mere sum of its parts. There is an element beyond the purely rational, and that element is love. OPPO Find 5 is infused with of our love, a love we wish to explore with the world. OPPO Find 5 is set to launch in early 2013 across selected markets. OPPO is a globally registered technology brand with a long history of serving customers in North America, Europe and Asia. With offices in 6 different countries, we deliver products that receive praise from all over the world. Our core value is to explore with courage and never stop finding, and since entering the mobile market in 2008, we have been restless in our pursuit of the latest technology, the highest quality and the most user friendly products. ← Konzept: Wird so das neue Samsung Galaxy S4 aussehen?